TRANSFORM AN EXISTING BASEMENT SPORTS BAR TO PROVIDE A UNIQUE OFFERING, FILLING THE GAP IN THE MARKET FOR A LOCAL VENUE TARGETED TOWARDS YOUNGER PATRONS. A DUSTY BASEMENT BAR TRANSFORMED. A WARM, INVITING EATERY SPRUNG FROM A CAVERNOUS UNDERBELLY. FOUR TOWERING STAINLESS-STEEL TANKS HOLDING 4000 LITRES OF HOUSE-BREWED BEER SPEAK TO THE MICROBREWERY OFFERING, WHILE FIREPLACES PLACED THROUGHOUT THE VENUE REINFORCE THE SENSE OF GROUNDED COMFORT. 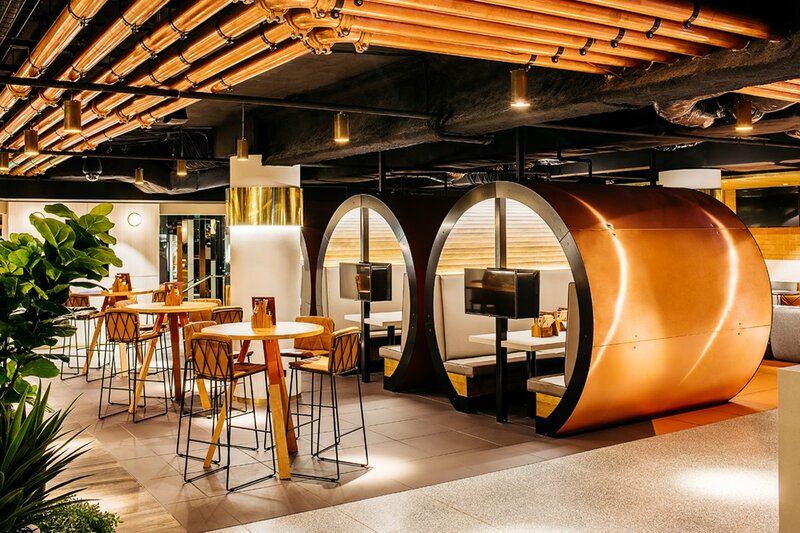 OUR DESIGN DIRECTION RESULTED IN A NEW SOCIAL HUB, SUCCESSFULLY ATTRACTING A NEW, YOUNGER CLIENTELE.